What I have here for you, is Under Pressure a Classic Rock song recorded by the group Queen along with David Bowie. This is the first image of this artwork. What you see is me putting down some paint, to get this project rolling. What I like about this first image is that I have roughed in some stripping, something I have not done in the past. 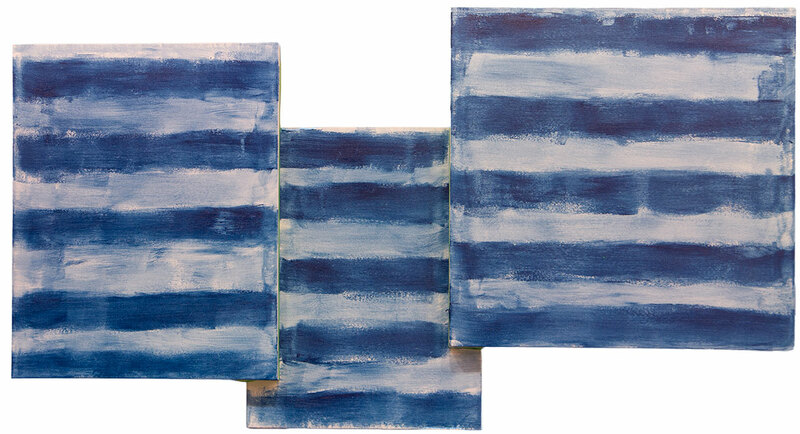 This is interesting, and totally without any logic, purpose, or plan beyond I like blue paint, and that the strips add contrast to whatever I am up to. The painting consists of three panels with a height of about 25 1/2 inches, by about forty-six inches in length. Here is the music. This video, which confused me at first, is actually a mix of two different live events, one staring Freddie Mercury from the band Queen, and the other , a tribute concert for Freddie Mercury featuring, in pale green, David Bowie. I may find more videos for I am on a path of serendipity discovery of the music of both Queen and Bowie. ~ by Scott Von Holzen on 01/24/2016.